Now it is convenient to store hats, accessories and shoes with the Stella 4 PC Corner Hall Unit in Cherry - Ace Decore! Wall Stand with Hanger and 2 Drawers is complemented by two convenient drawers. Hall Cabinet with Mirror will help to restore order in the hallway. Four deep drawers can store hats, scarves, gloves and other things, while the mirror is a wonderful way to visually expand the space of your even small hallway. 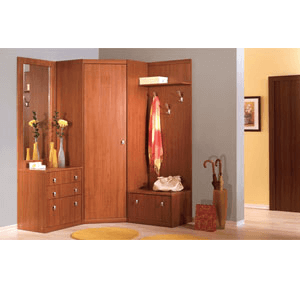 Corner Wardrobe is properly included into a modern interior of your hallway. It is characterized by a surprisingly large capacity. Functional Corner Shelf Stand will help solve the problem of storing books and other things. The shelves are rounded, and therefore take up less space male their using particularly useful. 4 PC Hall Unit includes: Wall stand with hanger and 2 drawers Hall cabinet with mirror Corner wardrobe Corner shelf stand Features: 4 PC Hall Unit Stella Collection Modern style Cherry finish Wall Stand with Hanger and 2 Drawers Hall Cabinet with Mirror 4 deep drawers Corner Wardrobe Corner Shelf Stand 5 spacious shelves Dimensions: Wall Stand with Hanger and 2 Drawers: W23.6 In. H77.8 In. D14.4 In. Hall Cabinet with Mirror: W23.6 In. H77.8 In. D14.4 In. Corner Wardrobe: W31 In. H77.8 In. D31 In. Corner Shelf Stand: W33.6 In. H77.8 In. D13.6 In. Products SKU: SB-955-956-953-954For Additional Pieces Please Scroll To The Bottom Of The Page. The idea to create an unusual design has been floating in the air for a long time. So, it was realized in (Art) front hall. Our set attracts attention of every person who sees it. No one stays indifferent to beautiful visual lightness of (Art). It is available in the following color: The case &#8212; Wenge dark oak Front &#8212; Wenge white oak Overall dimensions: W53.1 In. H88.5 In. D13.8 In.